New Delhi: Prime Minister Narendra Modi today waged a war against the yield of corruption and black money by announcing his government’s decision to declare that notes of ₹ 500 and ₹ 1000 denomination will not be a legal tender from midnight tonight. 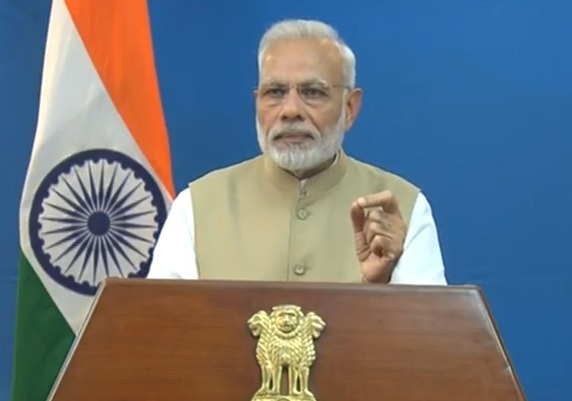 Addressing the nation, Modi announced the game changing move to wipe away the spectre of corruption and black money. He asked the honest people to be rady for sacrifice and said after Diwali, it is time for “all to celebrate the festival of honesty”. “It was very important to keep this news under wrap. Due to this, RBI and post office have a major task ahead and RBI has also decided that all banks will be shut for the public on November 9, the Prime Minister said adding on November 9 and at some places on November 10, ATMs will not work. A limit has been imposed on all card withdrawals. It will be ₹ 2,000 daily. This amount will be increased to ₹ 4,000 daily after a couple of days. Notes of ₹ 2000 and ₹ 500 will be introduced soon, the Prime Minister said and went on to inform the people that the RBI has decided to limit the notes with higher value. Modi further said that the ticket windows at Railway stations and Airports will accept ₹ 500 and ₹ 1,000 till November 11. For the initial 72-hours, Government hospitals will be accepting old ₹ 500 and 1000 notes till 11 November midnight.